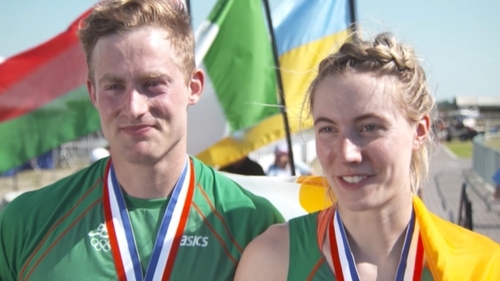 The Irish duo of Natalya Coyle and Arthur Lanigan O'Keeffe have won gold in the mixed relay event at the modern pentathlon World Cup IV event in Poland this afternoon. Coyle and Lanigan O'Keeffe saw off their nearest pursuers from Germany and Kazakhstan with plenty of time to spare. The Irish pair, both of whom finished in the top 10 in individual events at the Rio 2016 Olympic Games, were taking part in their first Mixed Relay of the 2017 UIPM season but there was no evidence of rust. They went second-quickest in Swimming behind Japan (Rena Shimazu & Hikaru Shimano; 1:56.51), and then led from the front in the Fencing Ranking Round. Ireland did not have their best day on horseback, surrendering 30 penalty points as Hungary (Karolina Palkovics & Norbert Horvath) led the way with a score of 296. But nothing could prevent them from both starting and finishing the Laser-Run out in front. Setting out 15 seconds ahead of host nation Poland (Dominiak/Staskiewicz), 22 ahead of Korea (Kim/Seo) and 28 ahead of Germany (Schleu/Zillekens), they never gave the chasing pack a chance. This was the fourth World Cup competition in the series after earlier rounds in Los Angeles, Cairo and Kecskemet. This season’s World Cup final will take place in the Lithuanian capital of Vilnius from 22-25 June. "We started off the day well and then we had a really good fence, and we didn't have a great ride, so it was lucky we were in a good position. It was a really good day," Coyle said afterwards. "I think it's great when you work together as pentathletes," said Lanigan O'Keeffe. "Myself and Natalya have a good relationship and when one of us is struggling we pick each other up. It makes it a little easier to stay focused."